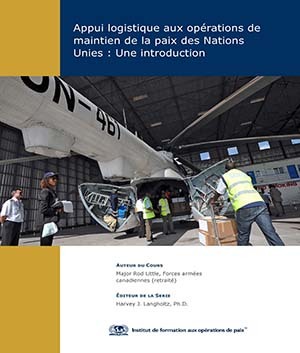 This course introduces students to logistics operations in United Nations peace operations. This basic course provides the background and rationale behind UN peacekeeping logistics, the key organizations responsible for providing logistical support, the strategies employed in the field and at Headquarters, the UN Global Field Support Strategy, management of contingent-owned equipment, the logistics activities during the life-cycle of a UN mission, how missions gain financial support, and the mission medical system. Eight lessons. This updated edition provides contemporary information on UN peace operations as the Organization begins a new era with the celebration of its 70th anniversary. COURSE AUTHOR: Major Rod Little (retired) served in the Canadian Armed Forces as a logistics officer, including stints with NATO and UN missions. He currently lives in the Philippines. Iniciar sesión para precios personalizados. Vea los videos disponibles con el curso. Comprar el Libro de Texto + Versión Electrónica . Este curso introduce a los estudiantes a las operaciones logísticas en las operaciones de paz de las Naciones Unidas. Este curso básico proporciona los antecedentes y los fundamentos de la logística de mantenimiento de la paz de las Naciones Unidas, las organizaciones clave responsables de brindar apoyo logístico, las estrategias empleadas en el campo y en la Sede, la Estrategia de Apoyo de Campo Global de las Naciones Unidas, la gestión del equipo de propiedad de los contingentes, las actividades logísticas durante el ciclo de vida de una misión de la ONU, cómo las misiones obtienen apoyo financiero y el sistema médico de la misión. Ocho lecciones. Esta edición actualizada proporciona información contemporánea sobre las operaciones de paz de la ONU cuando la Organización comienza una nueva era con la celebración de su 70 aniversario. AUTOR DEL CURSO: El comandante Rod Little (retirado) sirvió en las Fuerzas Armadas de Canadá como oficial de logística, incluyendo períodos con misiones de la OTAN y la ONU. Actualmente vive en Filipinas. Ce cours introduit la problématique des opérations logistiques des opérations de maintien de la paix des Nations Unies. Ce cours de base présente l’historique et la raison d’être du développement des questions logistiques au sein des opérations de maintien de la paix des Nations Unies, la stratégie employée au niveau du terrain comme au Siège, présente le cycle de vie d’une mission, explique comment est géré l’appui financier aux missions, et enfin présente les différentes composantes qui définissent l’appui logistique intégré au sein d’une mission. Huit leçons. Cette édition mise à jour fournit des informations contemporaines sur les opérations de paix des Nations Unies alors que l'Organisation entre dans une nouvelle ère avec la célébration de son 70e anniversaire. AUTEUR DE COURS: Le major Rod Little (retraité) a servi dans les Forces armées canadiennes en tant qu'officier de la logistique, notamment auprès de missions de l'OTAN et de l'ONU. Il vit actuellement aux Philippines. "EXELENTE CURSO Y LE DA CONOCIMIENTOS DE LOS PROCEDIMIENTOS DE NACIONES UNIDAS EN GENERAL"
"The course is very important for logicians. So I recommend to share the course as many candidate as possible. " "Its informative,educative,broad,and extensively covered all issues and methods of basic logistic fundamentals in UN organisation. Which also in brief cover military aspect of logistics and impact in operational planing "
"Easy to follow and understand, well done." "Great experience, very useful information." "Easy way to learn UN logistics at own time ." "Proud to win this course at the beginning of new year 2019 , i expect more victories during not only this year but also in my lifetime.Thank you for enabling me to find this online course." "Very useful and very reliable "
"The course is very useful"
"The Logistics System is vital to the value of continued healthy living. This confirms the famous statement he made during the Second World War (Armies walking on their stomachs) that proves that the Logistics System may be helpful to any force wishing to carry out its functions under any circumstances and at any time." "I LOVED DOING MY COURSE IT HAS ENHANCED MY SKILLS AND KNOWLEDGE TREMENDOUSLY "
"Its a thought provoking and e-learning platform makes its easy for all UN Components to undergo at own pace"
"Since am a logistician I found this course with vast knowledge about military logistics "
"Logistic in the area during peacekeeping operation"
"well structured and sequentially arranged "
"a wide range of covering for the subject"
"This course is very helpful to know about the functioning of the UN,DPKO, and several other wings of the great institution." "I learnt about how a DPKO mission start up, its mandate implementation and transition (liquidation process) logistic supports point of view." "I really enjoyed while getting my training. Thanks." "It has a very well defined outline of the main principles of surrounding Logistics work in whole." "Excellent course, very valuable in terms of logistics basic knowledge "
"This is very good course. I got thorough knowledge on basic Logistic matters." "This course is very interesting as it has familiarized me with the UN activities. " "It gave a general awareness on subj." "This is an excellent course for those wishing to contribute to the humanitarian crisis." "This course was very educative and has really prepared me for any peace keeping operation." "Logistic support is a complex component of the operational strategy to reach operational goals in the mission. It has to be handled with commitment and patience." "the course is very helpful and I urged everyone to do it"
"I took this course because it helped me to understand how logistics are deployed during UN peacekeeping missions"
"Excellent course and really benefit as the knowledge for the future guidance"
"The course is very excellent, I have discovered good areas in COE and management "
"yes i went through a nice experience of learning new things and i would like more of this thank you so much POTI"
"what i liked most in this course is how self-sustained services are reimbursed by UN "
"the course is excellent, it can direct my current work." "because I like this course for help me on future and to increase my knowledge, and to achieve my goal,"
"The course was clear with pictures as prove of what the UN is doing specially for my home country DRC"
"Very useful and interesting course"
"All UN materials must be kept well for proper management by conducting regular inspection"
"The learning materials are well packaged to suit distance learning and the assessment tools are clearly set for easy interpretation." "THE ANSWERS ARE STRAIGHT FORWARD BUT THOUGH"
"the composition of the course from an introductory part to the conclusion part is very good. every thing written inside is essential and up to date." "i will rate the course excellent"
"It has broaden my knowledge on UN logistics and I now understand somethings better. " "I really fight to get the logistics certificate but atlas I got it it is my Joy I thanks POTI." 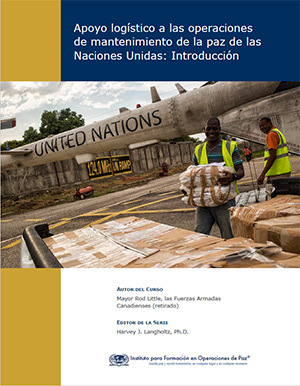 "Muy valioso el curso Logistical Support to United Nations Peacekeeping Operations: An Introduction"
"the course presents the required skills and prepares a student for career development"
"Very, very valuable course to me. It gave me a better understanding of the UN logistics process." "Information is relevant and well set out." "All the information one require about day to day logistics was very much part of the curriculum. Easy to comprehend." "GOOD ESXPOSURE TO UN LOGISTIC SUPPORT "
"Practical course on logistics in UN Peacekeeping Operations. Interesting and very useful." "I learn more about UN Logistic in this course. Faites ce cours et apprnez tout sur la logistic." "It was entertained and useful." *Las revisiones de los estudiantes solo pueden ser enviadas por un estudiante después de completar el curso. Student reviews represent the combined opinions of the English version and all translated versions of the course.